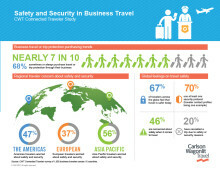 Millennials are much more sociable than older business travelers, and are also most concerned about their personal safety, according to data released today from the CWT Connected Traveler Study, a multi-generationalsurvey of more than 1,900 travelers from 16 countries. A full 58% of millennials travel with others, 43% travel with colleagues, and 15% with friends or family. In stark contrast, nearly three-quarters (71%) of baby boomers travel alone. Sometimes, they travel with colleagues (23%) but they rarely bring along friends or family (6%). Generation X travelers are somewhere in the middle, with 58% traveling alone, 31% with a colleague and 11% with friends or family. 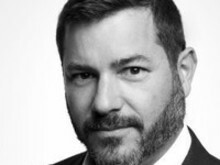 “We see a massive generational shift among the habits of younger travelers – the much-vaunted millennials,” said Julian Walker, Carlson Wagonlit Travel’s Head of External Communications. The study found that millennials – defined here as those between the ages of 24 and 34 – are most likely to cancel a trip over security concerns. Nearly one-third (29%) of millennials have done so, compared to 20% of generation X (ages 35-51) and only 12% of baby boomers. Similarly, almost half (49%) of millennials buy trip insurance, compared with only 36% of generation X and 31% of boomers (ages 52-65). Nearly half of millennials (45%) contact friends or family while traveling more than once per day, compared to 38% of generation X and 29% of baby boomers. 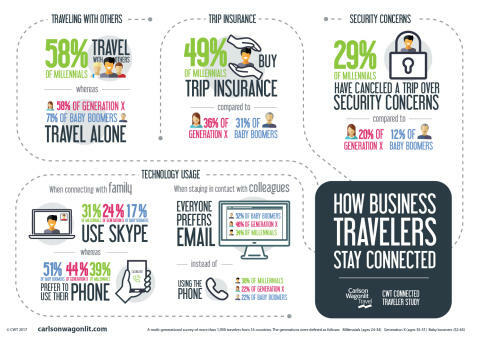 Millennials connect more with clients while traveling (55%) than generation X (44%) and boomers (35%) – and with co-workers (41%) versus 28% of generation X and only 19% of boomers. The use of technology also varies dramatically between generations. When it comes to connecting with family, boomers prefer to use their phone (51%), compared to barely half of generation X (44%) and only 39% of millennials. Conversely, a full 31% of millennials use Skype, compared to 24% of generation X, and only 17% of boomers. 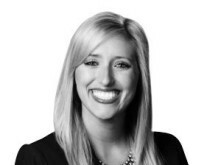 When it comes to staying in contact with colleagues, email is everyone’s preferred method. However, here too, the generations differed markedly. More than half (52%) of boomer’s use email, compared to 46% of generation X and only 34% of millennials. When it comes to using the phone, 30% of millennials and 22% of both boomers and generation X prefer to pick up the phone and call colleagues. 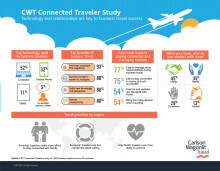 The CWT Connected Traveler Study was created by Carlson Wagonlit Travel and conducted through Artemis Strategy Group between 30 March and 24 April, 2017. Survey data was collected from more than 1,900 business travelers between the ages of 25-65 from the Americas (Brazil, Canada, Chile, Mexico and the United States), Europe (France, Germany, Italy, Spain, Sweden and the United Kingdom) and APAC (Australia, China, India, Japan and Singapore). To participate in the study, business travelers were required to have made more than four business trips within the past 12 months. The generations were defined as follows: millennials (ages 24-34) generation X (ages 35-51) and baby boomers (52-65). The purpose of this study was to understand how business travelers stayed connected to both work and home while on the road.